Where once I might have chosen Paul Handyside’s ‘Hip hip’ as my favourite Hurrah! 45, now it’s his ‘Gloria’ which has greater emotional sway. ‘Hip hip’ is necessarily celebratory, excitable and exciting, the adrenaline rush of poetic youth, but it’s also tinged with nostalgia and melancholy, for the many memories it conjures, for the distance which has opened up within me between the man I am now and the boy I was then. Perhaps inevitably at this distance, the lyrics read as and sound somewhat adolescent. And that’s fine, because if ever songs caught the rush of feeling that being young involves, the confusion and exaltation and cloud nine highs and dismal pressure drop lows, the happiness shot through with sadness and the sadness shot through with a refusal to be beaten, then it was the early songs of Handyside and Taffy Hughes, the Geordie Lennon and McCartney. 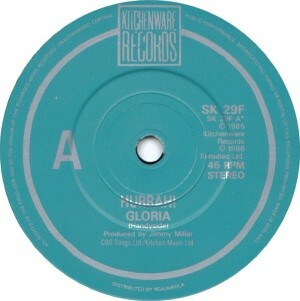 ‘Gloria’, with its Cyrano de Bergerac gallantry and transposition of a serenading or star-crossed lovers balcony scene to twentieth century Newcastle, is perhaps no exception, but it seems tempered by both a feeling of duende and a dreamlike quality; the dream that starts when you want it to. While the yearning edge of Handyside’s voice filled so many of his songs with a sense of melancholy and things not quite working out as he might have hoped and planned, here he manages to convey a sense of certainty and destiny that pervades waking and sleeping, night and day. It doesn’t hurt that musically, it’s a classic-sounding song which in my mind twines about Procol Harum’s ‘A whiter shade of pale’ like ivy or wisteria, the Hammond organ line of which was itself famously lifted from Bach. ‘A whiter shade of pale’ in turn makes me think of the Clientele’s ‘Isn’t life strange?’, and how’s that for a trio of timeless songs? ‘Trust in me, things I tell you…’ Hurrah! were a group of infinite importance to a small, select number of people; folk took the trouble to testify to this when I wrote about the group over at Backed with. Implored to do so by the collective persuasion of both Hungry beat and Are you scared to get happy? fanzines (the latter named after the rousing challenge in the chorus of ‘Hip hip’), I bought a copy of Boxed: long-shot pomes from broke players, which collected together Hurrah!’s early singles for Kitchenware, including ‘Gloria’. The title was borrowed from Charles Bukowski, whose novel Factotum I would have read around the same time, following up every suggested lead. Back then I never saw the delightfully silly and presumably somewhat satirical video for ‘Gloria’ featuring a dippy New Romantic-looking girl dancing (surely not the Gloria in question?) and bass player David Porthouse cross-dressing (now, if he were the Gloria in question, that would certainly give the lyrics some swing); all of which doesn’t quite undermine Handyside’s earnestness nor the enduringly affecting nature of the song. 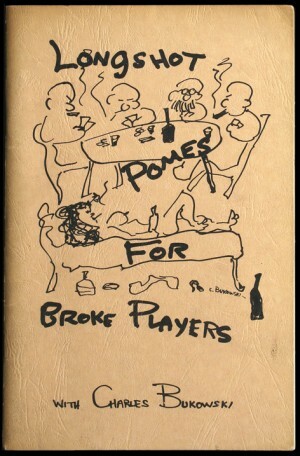 Image of Longshot pomes for broke players via bukowski.net. More than a bit prissy, this piece, but it was genuinely touching to be given a book in a bookshop, even if as I suspect was the case the bookseller in question ran her shop as a pretext for social interaction rather than because she needed to make a living. It’s been years since I read or re-read any of the many authors on these two pages, save for C.S. Lewis, inspired by Philip Pullman’s ideological objections. I forget quite why I did it, but I made up the novel Edward’s crumby day and its author Grantley Trillo, and got an earful from one or two people for doing so. I’ve occasionally felt that by way of restoring the natural order, I should write a novel of that title and with the characters I sketchily outlined, but given that no-one uses the word ‘crumby’ any more, I would have to pretend that it had been discovered in a distant relative’s attic where it had lain undisturbed since it was written in the seventies. I still maintain affection for Richard Brautigan’s books. I used to wonder whether the Coen Brothers would ever adapt one of his stories, as it seems to me that two or three of them have taken some essence from Brautigan – The big Lebowski, O brother, where art thou?, perhaps The Hudsucker proxy. Of Bukowski’s Factotum my chief memory is of Henry Chinaski being the sole person in his class of would-be taxi drivers to know that the only time it’s legal to take your eyes off the road is when you involuntarily do so by sneezing. Without at all wishing to be dismissive of how potently affecting his stories are, J.D. Salinger, like Kerouac, increasingly seems to me to be an author of truths for people in their teens and twenties. And I wonder if Salinger’s silence and Kerouac’s burgeoning misanthropy in later life relates to each man’s realisation of this, and that they lacked the energy or the wherewithal to re-establish themselves as authors of truths for what comes after that explosion of cynicism and idealism. They may in fact be extreme examples of the connected generality that people read less fiction and more non-fiction as they age.